It has been a while since the last installment of our Real Racism series – not because there isn’t plenty of it, but because so many other things are going on. This incident, however, is worth noting. The ranking officer of a Minneapolis police precinct was removed from his post Monday after an image of what appears to be a Christmas tree decorated with racist ornaments circulated on social media, authorities said. The removal came three days after two officers who were allegedly involved in decorating the tree were placed on paid leave. Minneapolis Police Department spokesman John Elder confirmed that Inspector Aaron Biard was removed from the top position at the north side precinct station where the tree was apparently photographed. 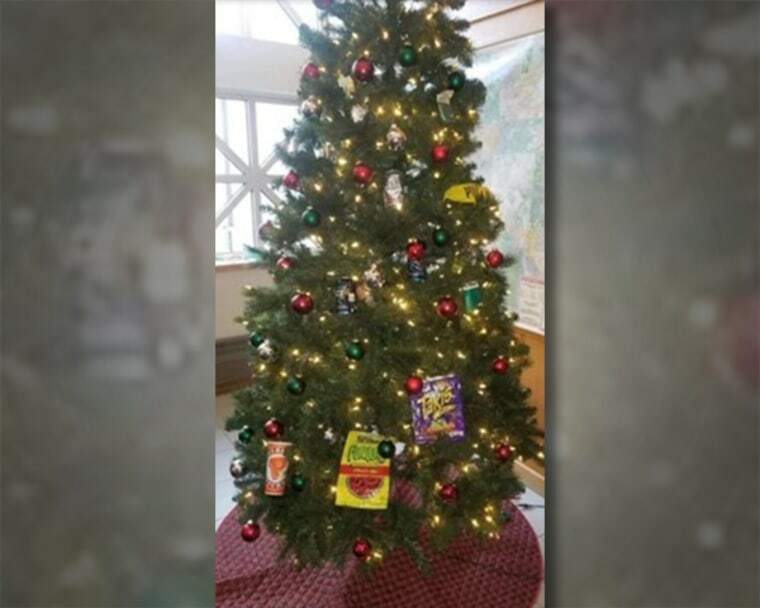 Pictures of the tree — ornamented with Flamin’ Hot Funyuns, a pack of Newport cigarettes, a Popeyes Louisiana Kitchen drink cup, alcoholic beverage cans and police tape — started circulating Friday. NBC affiliate KARE compared the photo with another from inside the 4th precinct station, and the background visible in the photos matched. Minnesota-based civil rights activist Ron Edwards referred to the tree decorations as a “wink wink” to racist stereotypes, the Minneapolis Star Tribune reported. Very clever: if you happen to be a racist with an IQ in mid-double digits. Yes, there are Black people who eat Flamin’ Hot Funyons, smoke Newports, like fried chicken such as the kind sold at Popeye’s, drink liquor, and there are Black people who break the law in ways that necessitate using police tape. Congratulations, to the geniuses who put this up; technically you have a point on all scores. But, guess what: there are White people who would qualify on every one of those accounts as well. And Black people who do and are none of those things. How do you think Italians would feel if that tree had nothing but pizzeria menus, toy guns and pictures of Don Corleone? Or how about a Jewish-oriented tree, with plastic big-noses and play money? The bottom line is that this is racist. 100% racist. And however many people at that precinct who thought it was a good idea to put it up and/or thought it was funny in any way are racist jerks who deserve whatever punishment they get. It might not change their hearts, but – if they don’t lose their jobs – at least it should make them think twice before pulling another stunt like this one. Real racism. It comes in all forms from all sources. No group is immune to it or from it; certainly not police who are entrusted with serving and protecting people who they stereotype this way. You would have to be a racist in order to see this as a racist incident. People need to stop making up something and overreacting to things that the civil rights guy even called “as a “wink wink” to racist stereotypes”. Stop thinking the absolute worst in people. On this one we’re going to have to agree to disagree. When a tree is “decorated” with every stereotype of a particular group the “decorator” can come up with, it is not a random occurrence. It’s a message – in this case “you’re Black so here’s what I know about you”. If this were not a police station I might agree but all of those things in my mind describe cops regardless of color.